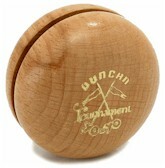 Duncan's were considered the "Cadillac" of yo-yos. I forget the name of the competing cheaper brand. Remember the variants of these that came later on? The clear plastic ones that had light bulbs inside and lit up as they headed down, and the "butterfly" models that had flared shapes. I remember having a Duncan yo-yo, but the only thing I could make it do is go up and down.